J. Cole, a musical messiah to many, either struggles to tell compelling stories — or his life is actually boring. 4 Your Eyez Only, J. Cole’s fourth studio album in five years, fails to live up to the promise of his great 2014 Forest Hills Drive, but showcases him perfecting his craft as a storyteller, and striving for emotional potency. The new album, in a twist, tells the linear story of a man — not J. Cole — caught in the streets and trying to preserve his legacy. J. Cole tells the story of a childhood friend who may or may not be a fictional representation of a real friend, and does so without any concern for being popular on terrestrial or satellite radio. The album’s projected to sell more than 500,000 copies in its first week of release. Eyez is more dry than Forest Hills Drive. That album’s heavy baselines and triumphant horns are replaced on Eyez by subdued snares and softer melodic backdrops. The new album lacks the production highs and anthemic nature of its predecessor’s G.O.M.D. It lacks lyrical onslaughts like those on Drive’s Fire Squad. J. Cole’s new Eyez is simply more boring sonically, even if, to his horde of die-hard fans, the subject matter of police brutality, incarceration, and love excuses the lack of musical excellence — as if enjoyable listens and lyrical depth are mutually exclusive. Here’s the rub: You don’t. J. Cole’s reputation and success as a rapper who doesn’t celebrate materialism has made him a symbol of cultural elitism for folks who can feel superior to fans of, say, a more simplistic kind of rapper like Lil Uzi Vert. This is a phenomenon J. Cole seems to know about and embrace on the video for Everybody Dies that he released in the lead-up to Eyez. It’s one of two videos included in the Eyez documentary in which he mostly hangs around with friends and makes music, and neither of the two songs made the album. He raps, Lil’ whatever — just another short bus rapper. It’s the type of lyric from J. Cole that demeans popular, supposedly shallow subject matter. He can color his usually mundane and relatable lyrical content with another person’s stories of street life — and he can also keep his fans at arm’s length. Point of fact: the new song, Change. It’s as didactic and corny as anything in his catalog. The reprise, The only real change comes from inside, is the type of lyric, like Big Sean’s One Man Can Change The World, that sounds great as a Facebook status or Instagram meme but sounds like the log-off line of an after-school special. Fortunately for J. Cole, there’s a theme in Eyez that taps into a universal emotion: the fear of mortality that comes with being in love, and having children. More on that, later. J. Cole was raised in Fayetteville, North Carolina, in a tiny home held together by his mother. He didn’t come up in abject poverty. He didn’t sell drugs to “make it,” or ever really fear for his life. Young Jermaine Lamarr maintained good grades, played basketball and graduated in 2007 (with a 3.8 GPA) from New York City’s St. John’s University. He worked as a bill collector and as a skating rink mascot until his rap career took off. It’s a story far more people can relate to than, say, Lil Wayne’s tales of being a child superstar who almost died after shooting himself in the leg. Or Kendrick Lamar’s stories of police raiding his house to arrest his uncle, or possibly having shot someone at age 16. Or Drake’s gossipy looks at his flings with superstar women around the world. What J. Cole does masterfully is interweave his own personal story into that of the “friend,” making the differences between their stories imperceptible. J. Cole is just J. Cole. And for people who want to listen to a rapper who can tell their stories, he is a messiah. Cole has a dedicated fan base who purchase his albums and send them to the top of the charts with radio requests and streaming. On social media platforms, they defend his every word. This all makes J. Cole’s artistic decisions on Eyez even more interesting. The concept is first-person narrative told from the perspective of “James McMillan Jr.,” who grew up as a drug dealer. The friend, apparently deceased, lived a loose and fast life full of danger, and becomes concerned about his mortality when he falls in love and has a daughter. So he entrusts his life stories as a kind of last will and testament to J. Cole. The drug dealer narrative(s) allow J. Cole to achieve two goals: He can color his usually mundane and relatable lyrical content with another person’s exciting stories of street life — and he can also keep fans at arm’s length from his personal life. J. Cole seems to be projecting his own feelings towards his real-life wife onto McMillan’s in Fold Clothes, which has become a hashtag, and in which he screams I want to fold clothes for ya, I wanna make you feel good. He’s presenting emotions — with a buffer. Yet it is kind of masterful the way he can interweave his own personal story into that of the “friend,” making the differences between their stories imperceptible. For instance, on Neighbors, J. Cole stresses over the real life way he’s treated by his white North Carolina neighbors unaccustomed to seeing young black wealth in their neighborhoods. One thing is for sure though / The fame is exhaustin’, he rhymes over a stripped-down double-time snare. That’s why I moved away / I needed privacy. J. Cole’s reputation and success as a rapper who doesn’t celebrate materialism has made him a symbol of cultural elitism. It’s that search for privacy that has made J. Cole such an enigmatic figure, as fans clamor for more, decoding lyrics to see how much of his personal life they can glean. He’s kept his girlfriend and subsequent marriage a secret (he was outed accidentally in a January interview with Ryan Coogler), and seems to want to eschew fame. He wears flip-flops and sweatpants to White House meetings. These characteristics, of the elusive, outsider MC, have only endeared him to rabid fans. A central theme of J. Cole’s Eyez is a self-conscious preoccupation with creative legacy — and staying alive to be around and take care of family. Due to his commitment to personal privacy, and his choice to tell another man’s story in the first person, we have no clue if J. Cole is expecting a child, just had a child or just happens to be thinking about children. Social media are alive with guessing games about his familial status. But when he tackles the idea of mortality and fatherhood, he becomes as real and relatable as he’s been his whole career. When the Cole-as-narrator finds love in She’s Mine Pt. 1, he addresses his mortality head-on: I don’t wanna die no more. And the title track is peak J. Cole the storyteller slash emotional gut-puncher. In it the narrator pleads with himself, God, and Time about how his daughter will never get to hear the song, and instead he’ll tell her to her face about his life. 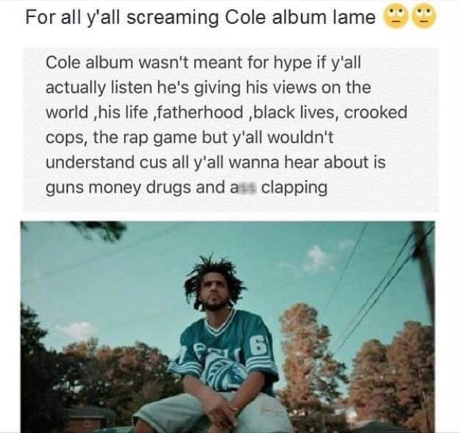 But, of course, he doesn’t survive his lifestyle and J. Cole is left to deliver the message. J. Cole seems to be at a crossroads where he needs to express emotion but still wants to keep a safe distance. Eyez is at its best when J. Cole is stripped-down and raw. But the final track of the album — Not because he screamed, “F— the law” / Although that was true gives hope that a less-calculated J. Cole will be the norm.